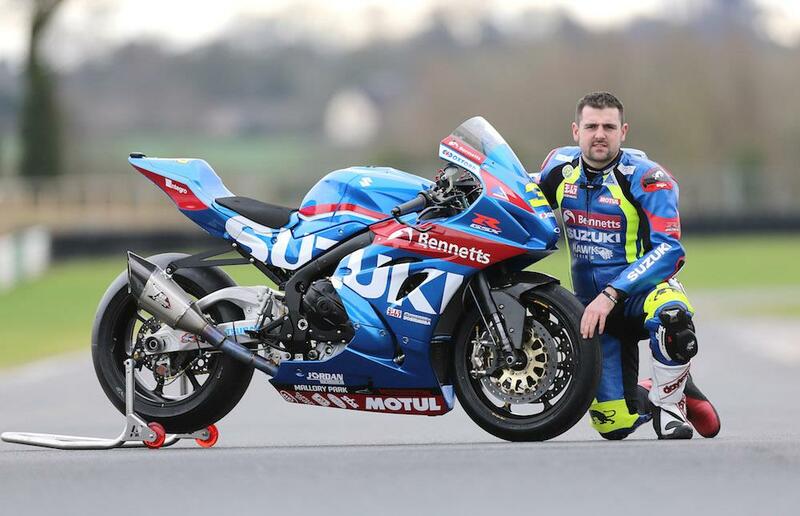 Michael Dunlop will race the all new GSX-R1000R in Bennetts Suzuki colours at this year’s Isle of Man TT after signing a deal to remain with his trusted Hawk Racing squad. The 13-time TT winner’s future has been the subject of much speculation over recent months, with questions raised over whether the Ballymoney racer would opt to race a brand new bike again after the problems he suffered with Milwaukee Yamaha and the new R1 in 2015. However, Dunlop has once again put his faith in the father and son team of Stuart and Steve Hicken, who have bagged factory support from Suzuki’s Yoshimura racing arm for the 2017 North West 200, Isle of Man TT and Ulster Grand Prix. “I’m back with the dream team for another wee spin,” Dunlop told MCN’s Stephen Davison in an exclusive interview. “It’s good for me and it’s good for Steve because the team has full factory support again. Yoshimura’s involvement is a key factor, a really big thing for me. Their support and getting the right stuff from the factory is crucial. Dunlop will also ride a GSX-R liveried in his own MD Racing colours in the Superstock categories, as well as an as of yet undecided Supersport machine. The Ulsterman will also join Bennetts Suzuki's all-star line-up of Sylvain Guintoli and Taylor Mackenzie in the opening round of the 2017 MCE British Superbike Championship at Donington Park. Read the full, exclusive interview with Dunlop in Wednesday 22nd February's MCN.